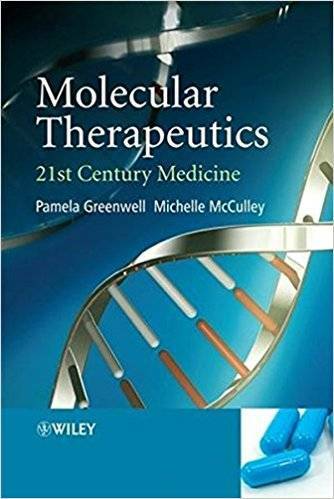 Pamela Greenwell, Michelle McCulley, "Molecular Therapeutics: 21st Century Medicine"
Molecular therapeutics refers to the developments in molecular biology that are focused on treating disease with new molecular-based drugs. By taking advantage of recent advances and increased understanding in the field of human genetics, this book provides essential background knowledge and key literature on a broad range of novel approaches and disciplines. These include making recombinant proteins, xenotransplantation gene therapy and therapeutic cloning. Molecular Therapeutics: 21st Century Medicine describes the techniques - including their associated benefits, problems, pitfalls - and discusses their applicability with respect to treating microbial, inherited, multifactoral and acquired diseases. The book also pays specific attention to the ethical issues associated with this new field. Molecular Therapeutics: 21st Century Medicine is a comprehensive, accessible and engaging guide to the rapidly developing field of molecular therapeutics. It is essential reading for all students in this area of research and also of interest for health professionals involved in these novel therapies.